​Honest stories, memorable hooks, beautiful harmonies - this is what to expect from indie folk outfit The Tipsy Scholars’ (FKA The Gypsy Scholars) debut EP Nowhere to Be. Having already released the powerfully catchy single Cold Hands, the remaining four tracks shape a refined and matured sound for the Sydney and Canberra based band. Recorded at Rancom (Sydney) and Myall (Canberra) studios, engineers Ted Howard and Louis Montgomery have enabled the band to successfully translate their onstage energy and personality into a cohesive and musically rich body of work. From the more brooding and delicate moments of Calculated Note and Andy Warhol, to the rip roaring energy of Run from the Rampage, the EP is a perfect balance of textural indulgence and blissful simplicity. The lead vocals of Conagh McMahon-Hogan and James Kelly blend seamlessly throughout all five songs, while the dynamic range and creativity of Joel Shapero (Bass) and Alec Brinsmead (Drums) provide a versatile rhythmic foundation for each tune. 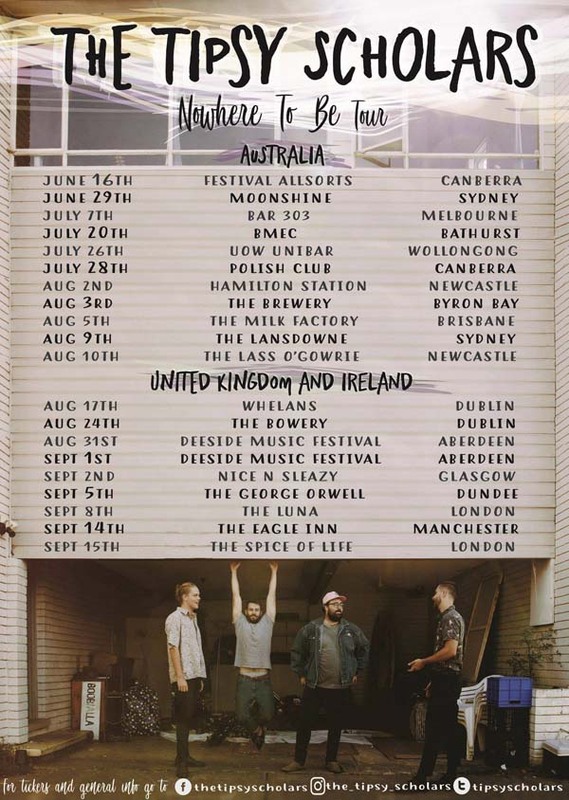 To celebrate the release of Nowhere to Be the band will be embarking on their biggest tour yet with a massive 12 dates along the east coast of Australia. With the EP’s lead single, Cold Hands being added to over 70 radio stations across Australia, The US and The UK and the international fanbase acquired through online streaming platforms, the four piece are excited to announce they will also be touring the United Kingdom and Ireland. With festivals in Ireland, Scotland as well as headline shows across England, the The Tipsy Scholars are keen to show off their musical wares to a brand new audience in what will be a tour to remember!